At Williamson, Clune & Stevens, our experienced lawyers are dedicated to giving exceptional legal counsel as we guide our clients to the best outcome possible. 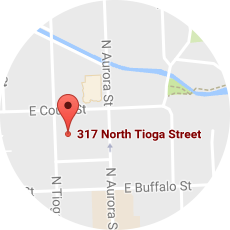 We do so efficiently and effectively in the courtroom and at our law firm, which is located in the heart of downtown Ithaca, New York, across the street from the county courthouse. We serve Central, New York and the Finger Lakes Region including Elmira, Cortland, Watkins Glen and Auburn. To schedule a consultation with an attorney at our office, call us at 888-863-3341 / 607-273-3339 or complete the online contact form below. Please call Williamson, Clune & Stevens at 888-863-3341 / 607-273-3339 or contact us online to speak with our attorneys regarding your legal needs.